At one of my family get togethers, I was sitting at the table talking to an aunt and we came up with this light and refreshing drink! Who doesn’t love watermelon or coconut juice? I poured a glass of coconut juice into a cup and my aunt had a bowl of watermelon in front of her. I took a couple chunks and dropped it in to my cup. My aunt suggested I add a few mint leaves. 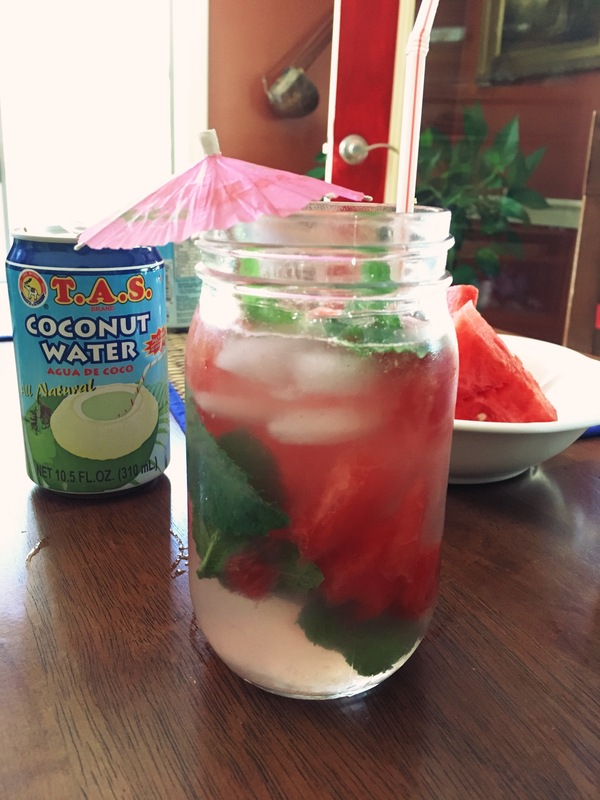 I added a few ice cubes on top, and the Coco-Melon drink was born! Just in time for those July 4th barbecues! Break up the watermelon in the glass, add the mint, and if you want, a shot of light rum or vodka. Fill the rest of the glass with ice cubes and pour the coconut juice over. Give it a couple of stirs and enjoy! Oh wow, this looks so fresh and delicious!